Developing sustainable tourism in combination with preserving and promoting national cultural values, and protecting landscapes and the environment is among targets set in Vietnam’s master plan on tourism development by 2020, with vision to 2030. 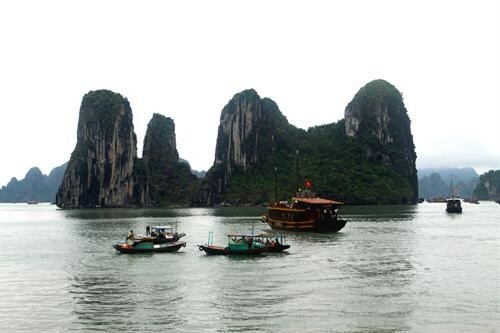 Ha Long Bay, a renowned tourist attraction in Vietnam. To achieve this goal, the country needs to carry out comprehensive measures like completing legal system, implementing overall tourism development plans, enhancing competitiveness, professionalising tourism promotion, protecting local culture and natural environment, and training human resources. According to the Vietnam National Administration of Tourism under the Ministry of Culture, Sports and Tourism, the Vietnamese tourism sector has enjoyed sound growth in number of tourists, revenue and accommodation facilities since 2011. Tourism has made significant contributions to protecting heritage values and relic sites in many localities. It has an important position in the country’s socio-economic development strategy. On the occasion of World Tourism Day 2017 (September 27), themed “Sustainable Tourism – A Tool for Development”, Secretary General of World Tourism Organisation Taleb Rifai delivered a message saying that respecting nature, culture and the host will make significant contributions to ensuring sustainable tourism development. He stated that tourism is the third largest export industry in the world after chemicals and fuels. It brings hope, prosperity and understanding to many people in the world, he said. Over 1.2 million travellers crossed international borders in 2016 and the figure is expected to reach 1.8 billion by 2030. The United Nations General Assembly declared 2017 as the International Year of Sustainable Tourism for Development, an opportunity to promote tourism development to build a better future for people, planet, peace and prosperity.